Alice Glascock married Samuel Fuller.1 Alice Glascock died before 1613. [S182] Social Security Death Index (on-line), Ancestry.com, SSDI, Ancestry.com, SSAN 131-16-7407. Elkanah Elms married Sarah Lazell. Sarah Lazell married Elkanah Elms. Parkes was a memberof the State Legislature in 1857. Parkes and Emily were enumerated in the 1850 Suffield, Hartford Co., CT, federal census, page 109. He was a farmer, age 55, she was 53. Children in the household were Mary 20, Georgianna 17, Isadorah Hazard 11, James P. Hazard 8, and numerous employees. Parkes and Emily were enumerated in the 1860 Suffield, Hartford Co., CT, federal census. He was a farmer, age 67, she was 65. Children in the household were A. W. Gilbert 29, Mary Gilbert 30, and James P. Hazard 19. Emily was enumerated in the 1870 Suffield, Hartford Co., CT, federal census. She was 75. Children in the household were Mary W. Gilbert, 39, Minnie Gilbert 13, Emily Gilbert 10, and William(?) O'Brien, 14. Son Frank P. (Francis P.) age 42, lived next door. [S137] Elisha Scott Loomis, Joseph Loomis, Pages 184, 255. [S137] Elisha Scott Loomis, Joseph Loomis, Page 255. [S137] Elisha Scott Loomis, Joseph Loomis, Page 256. Philip and G. L. were enumerated in the 1860 Chicago, Cook Co., IL, federal census, ward 1, page 289, dwelling 1673. He was 29, she was 27. Children in the household were Emma E. 5, and Philip Jr. 1. 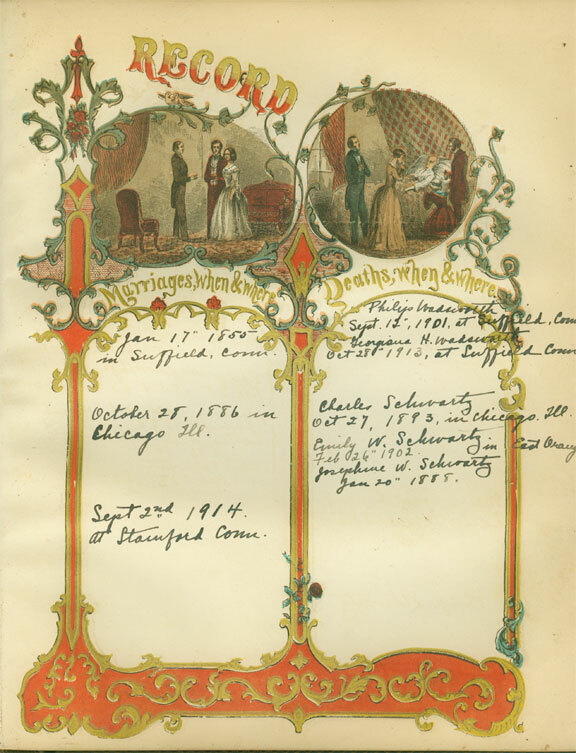 Philip and Georgianna were enumerated in the 1870 Chicago, Cook Co., IL, federal census, Ward 3, page 329. He was a Clothing Merchant, age 38, she was 33. The only child in the household was Emma 15. 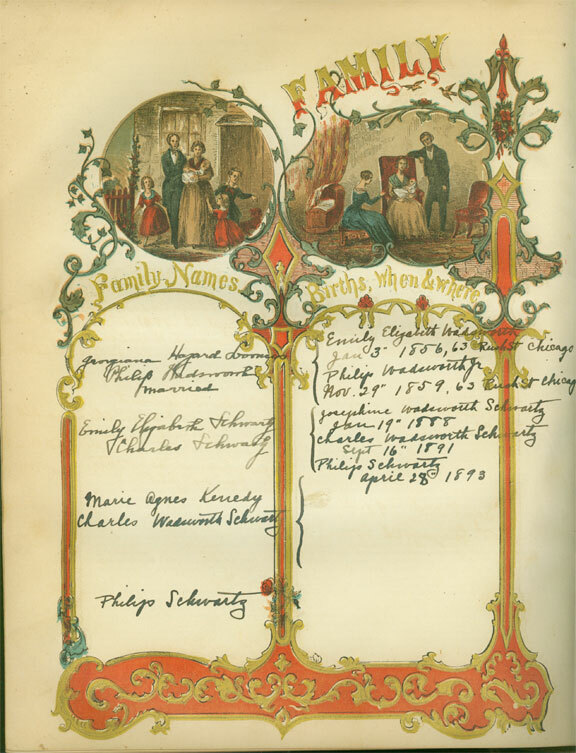 Philip and Georgianna were eumerated in the 1900 Suffield, Hartford Co., CT, federal census, ed 222. They were in the household of daughter, widow Emily W. Schwartz. Philip was 68, she was 65. Emily was the only surviving child. Widow Emily was enumerated in the 1900 Suffield, Hartford Co., CT, federal census. She was a widow, age 43. There were two children in the household, Charles W. 8, and Philip 7. [S528] Ann Smith Lainhart and Robert S. Wakefield, MF 22, page 17. Clement Soule was the son of Latten Soule. George Soule was the son of George Soule and Mary Bucket. Latten Soule was the son of Nathen Soule. Nathen Soule was the son of George Soule. 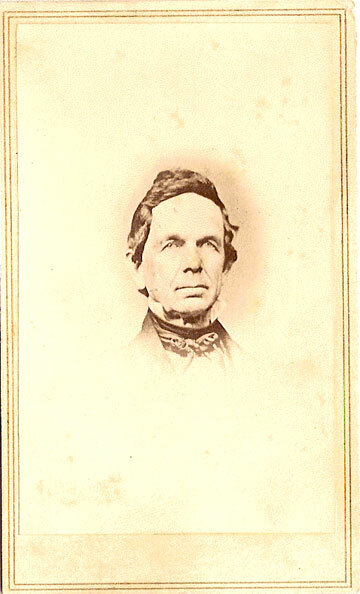 George Soule was the son of Nathen Soule. Zachariah Soule was born by 1627.1 He was the son of George Soule and Mary Bucket. Frank Soule was born circa 1847 at CT.1 He was the son of Henry Birdsall Soule and Caroline Augusta White. Frank Richard Soule was the son of Frank Soule. Mary Elizabeth Soule was the daughter of Frank Richard Soule. Children of Abigail Percilla Lair and Linus Noble Holcombe Jr.
Arthur and Myrtle were enumerated in the 1930 Coloma, Whiteside Co., IL, federal census. He was a railroad worker, 38; she was 34. The only child in the household was Irene, 8. Mrs. Arthur Langford, 1010 Ave. D. Rock Falls, passed away at 2 a.m. Wednesday after an illness of the past few years. The body rests at the Melvin funeral Home where friends may call after Thursday noon. Funeral rites will be conducted at 2 p.m. Saturday in the funeral home by Rev. Harry E. Shifter of Rock Falls Christian Church. Mrs. Langford was born Feb. 24, 1896 in Amboy, the daughter of Linus and Abbie Holcomb. She was united in marriage with Arthur Langford Nov. 11, 1920 at Clinton, Ia. Surviving are her husband and one daughter, Mrs. Charles (Irene) Love of Sterling, three grand children, Judith, Jerry, and Kathy Love, Sterling; three sisters and five brothers: Mrs. Bertha McNinch, Mrs. Jeanette Bell and Gerald, Harold and Walter Holcomb of Rock Falls, Mrs. Nora Bonnell of Shannon, Richard Holcomb of Winthrop Harbor, and Linus Holcomb of Waukegan. She was preceeded in death by her parents, three sisters and one brother. Mrs. Langford was a member of the Baptist Church. Elmer and Carrie were enumerated in the 1930 Coloma, Whiteside Co., IL, federal census. He was a farm laborer age 33, she was 29. Children in the household were Edwin 8, Thomas 7, Silas 4 years 2 months, Mary 3 years 3 months, and Earl 9 months. Elmer died from a ruptured spleen after a silo collapsed on him. He may have served in the Army during World War I. He was a tall, handsome young man, a few inches taller than his father who had been 6'1" in his youth. After his death the children were adopted-out and lost track with the rest of the family until nearly 70 years later. Carrie had Margaret, Carol, and Clifford Ennis in her subsequent marriage. Linus and Clara were enumerated in the 1930 Shields, Lake Co., IL, federal census. He was a machinist in a hardware foundry, age 30, she was 22. The only child in the household was Betty M. 3. [S182] Social Security Death Index (on-line), Ancestry.com, SSDI, Ancestry.com, SSAN 331-10-3380. Sherman and Abbie were enumerated in the 1930 LaMoille, Bureau Co., IL. He was a farm laborer age 34, she was 29. Children in the household were Grace 8, Dorothy 6, Raymond 3, and Eleanor. [S512] Robin Holcomb, "Linus Noble Holcombe Jr.," e-mail to James H. Holcombe, 29 April 2004, SSDI shows death as 15 may 1991 in IL; SSAN 353-32-7512. Gerald and Myrtle were enumerated in the 1930 Shields, Lake Co., IL, federal census. He was an asbestos laborer, age 27, she was 24. The only child in the household was Ellen 1 year 3 months. Red and Myrtle also raised Stella Baker Duenow and Juanita Bell Insley, daughters of Red's sister, Julia Janet Bell. [S182] Social Security Death Index (on-line), Ancestry.com, SSDI, Ancestry.com, SSAN 331-10-2914. [S807] Find A Grave, online http://www.findagrave.com, memorial # 102830336. [S182] Social Security Death Index (on-line), Ancestry.com, SSDI, Ancestry.com, SSAN 324-50-7653. Irving and Janett were enumerated in the 1930 Hume, Whiteside Co., IL, federal census. He was a farm laborer age 33, she was 23. Children in the household were Chas 3, Bertha 1 year 6 months, and Alberta 4 monthhs. Children of Julia Janet Holcombe and Irving Silas Baker Jr.
Richard E. Holcomb, 75, Edgewild Nursing Home, Sterling, died Tuesday afternoon at Sterling Community General Hospital. Funeral services will be held at 1:30 pm on Thursday at the Melvin-Schilling Funeral Home, Sterling, with the Rev. James Werner, pastor of the Rock Falls Congregational Church, officiating. Burial will be in the IOOF Cemetery, Rock Falls. visitation will be held on Thursday from noon til the hour of services. Richard Holcomb was born on Aug. 6, 1909 in Amboy, the son of Linus and Abbie Lair Holcomb. He was employed as a welder prior to his retirement for the John Mansville Manufacturing Company, Waukegan. Surviving are one son, Daniel, Winthrop Harbor; one daughter, Patricia Heiney, Winthrop Harbor; one brother, Harold, rock Falls; one sister, Mrs. Abbie Bonnell, LaGrange, GA; and four grandchildren. [S182] Social Security Death Index (on-line), Ancestry.com, SSDI, Ancestry.com, SSAN 331-10-2796. [S807] Find A Grave, online http://www.findagrave.com, memorial # 125423571.